From Eric Bush: Just 44% of developed market stocks have outperformed the MSCI World Index over the past 200 days compared to 57% outperforming on average over the past 15 years. As the chart below illustrates, there is a fairly strong negative correlation between the percentage of stocks outperforming and the direction of the index. As stocks move higher, fewer stocks outperform. The current reading of 44% has been reached just twice in the past 15 years: in 2000 and 2012. So even as correlations have fallen to multi-year lows in many parts of the world, the current environment isn’t exactly a home run for active funds because the pool of stocks outperforming is shrinking. 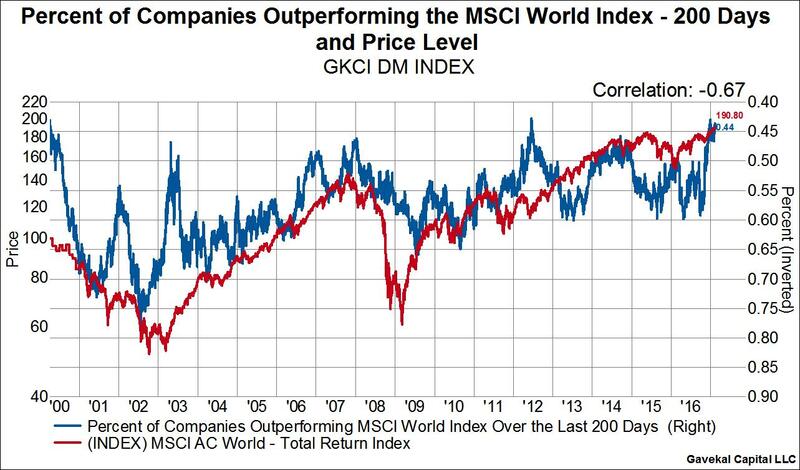 The number of stocks in the GKCI DM Index that were outperforming the MSCI World Index back in September was roughly 1215 (59% of the total 2049 stocks in the index). Today, only about 906 stocks have been outperforming (44% of the total 2049 stocks in the index). If the market can continue its push higher then we might end up seeing less than 2 out of 5 stocks actually outperforming the market, which would take out levels hit in 2000. The iShares MSCI ACWI Index Fund (NASDAQ:ACWI) was unchanged in premarket trading Tuesday. Year-to-date, ACWI has gained 4.82%, versus a 4.13% rise in the benchmark S&P 500 index during the same period. ACWI currently has an ETF Daily News SMART Grade of A (Strong Buy), and is ranked #2 of 61 ETFs in the Global Equities ETFs category. This article is brought to you courtesy of Gavekal Capital.